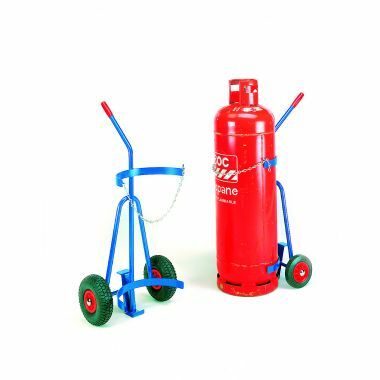 G-Force supply a wide range of gas bottle trolleys for safely handling, storing and transporting gas bottles, gas cylinders and gas tanks. An ideal solution for many industries in which bottled gases are required the cylinder trucks and bottle trolleys provide a secure solution for keeping the gas bottles upright when stationary and prevent them from rolling whilst being transported. 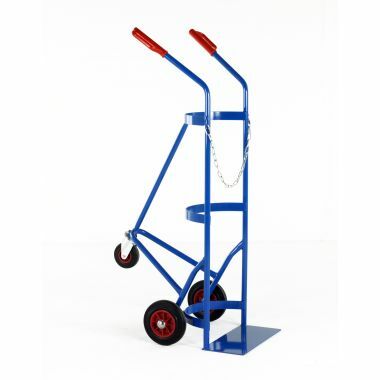 Our range of gas cylinder handling equipment also includes a variety of different drum trolleys, drum stands and gas bottle trolleys designed to climb different heighted platforms safely. Highly manoeuvrable and hard-wearing our gas bottle trolleys and cylinder trucks are a proven solution for gas handling and transport. 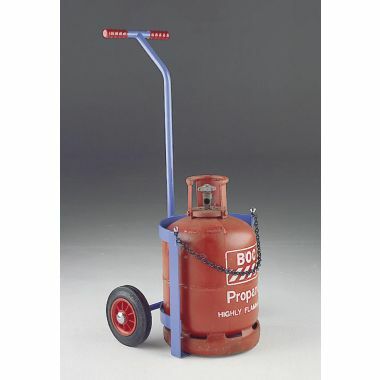 Designed to handle the weight of a full gas bottle or cylinder the gas bottle trolleys incorporate a flat base for the bottle or tank to rest on and a securing belt or chain to prevent it from falling out. The cylinder trucks are then designed to tip backwards, distributing the weight of the bottle and making it easy to transport. The model of cylinder truck varies from 2 to 4 wheeled trucks and trucks designed to handle single or double bottle loads; a choice of solid or pneumatic tyres enable the gas bottle trolleys to be used across a multitude of terrains. 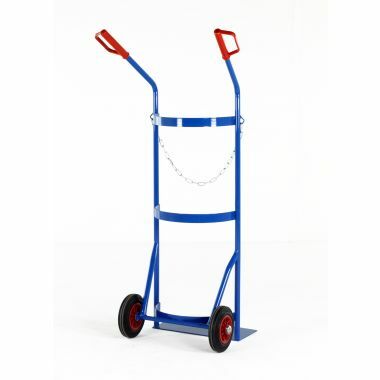 Heavy metal or plastic drums can be awkward to store as well as transport but with our drum trolleys and drum stands this can be made much easier. Drum stands enable the drums to be stored on their sides and additional drip trays can be added to prevent spillages. 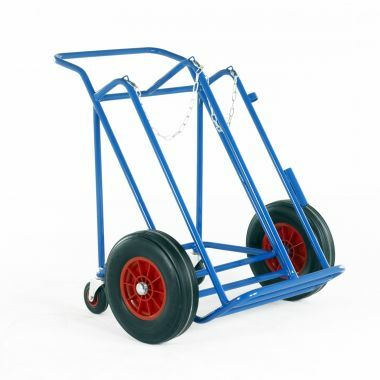 Drum trolleys are designed to easily lift and transport the drums throughout an environment to where they are required. Platform loading drum trucks are ideal for manoeuvring drums and casks from one area to another and for deliveries where steps or different levelled platforms may pose an issue for standard trolleys. 1. 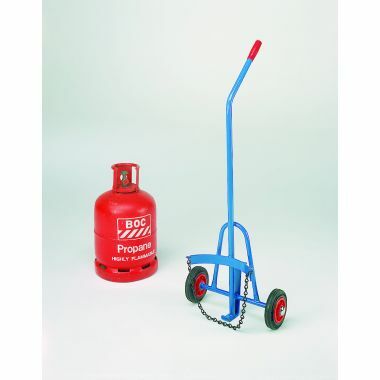 Retention chains and a stable and structured base allow the gas bottle trolleys and cylinder trucks to handle gas bottles, tanks and cylinders in a safe, secure and upright position. 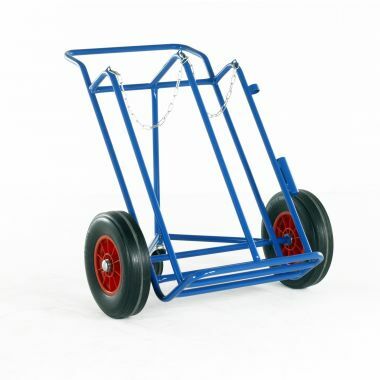 Easy to handle and manoeuvre the gas bottle trolleys can be supplied in a wide range of models and sizes to suit a variety of different shaped gas bottles. 2. 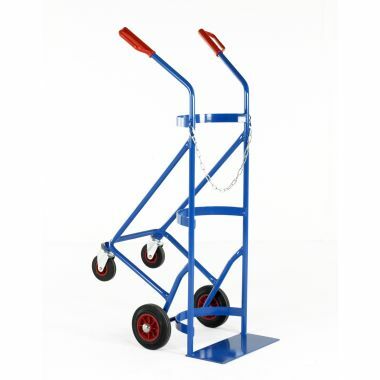 Our drum stands and drum trolleys are ideal for handling and storing plastic or metal drums. Platform loading drum trucks allow the drums to be transported up and down between different levelled platforms, ideal for deliveries of drums where steps would normally pose a problem. 3. 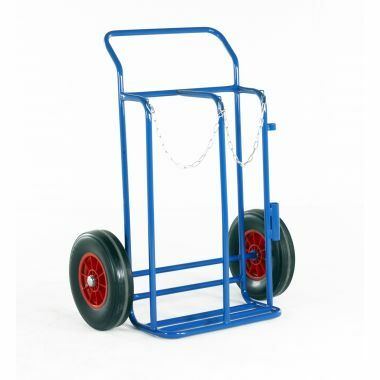 Designed to offer a handling solution for any terrain our bottle trolleys can be supplied with solid or pneumatic tyres. 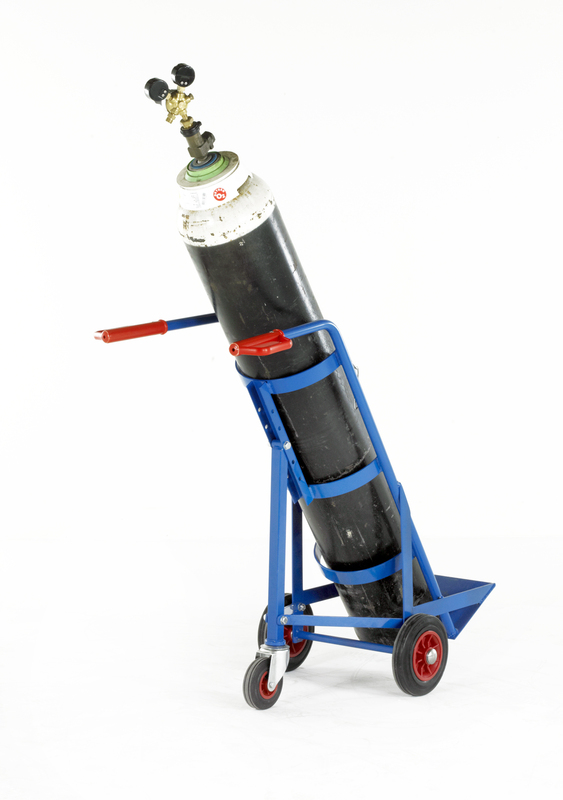 Pneumatic tyres are ideal for unlevelled terrain and are often used to transport the gas cylinders outdoors such as on building sites.